Sorry Lehmann, the cat's out of the bag. Quillette exists to give the alt-right the opportunity to rebrand itself for low-information centrists. Feminists - like the alt-right, Claire Lehmann hates feminists with the fire of a thousand suns. Islam - Bigots gonna bigot. Justin Trudeau - this is undoubtedly due to the fact that Trudeau is (a) liberal, (b) feminist and (c) the focus of a sick creepy obsession by Ezra Levant* for whom Lehmann worked (alt-right Rebel Media) while at the same time running Quillette. Claire Lehmann is a pathetic internalized-misogyny alt-right loser who runs a trashy alt-right web site. 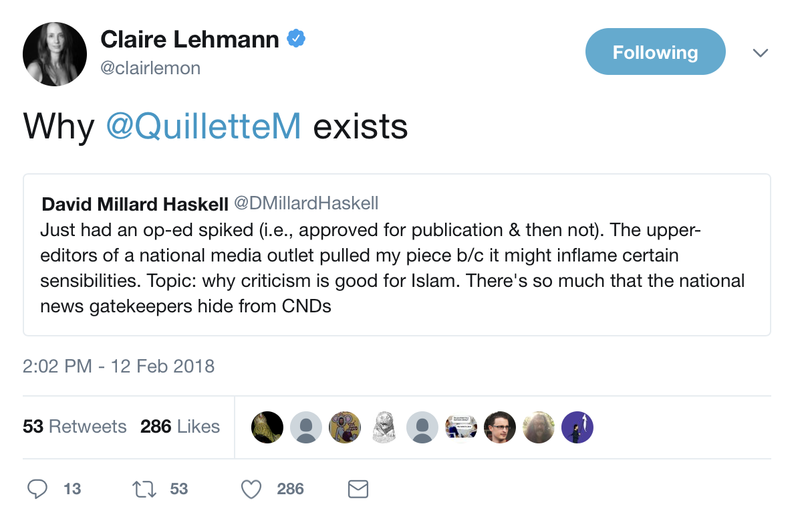 And Quillette must hire grad students because real writers with any skill and self-respect don't work for Quillette. * I am not kidding that Levant is creepy ~ just watch this "My Little Pony" video. Levant's unconvincing attempt to convey irony while declaring his love for Justin Trudeau is a ghastly spectacle indeed. Levant kept up the "shiny pony" thing when he covered the Trudeau vs. Brazeau boxing match. I'd be willing to bet the moment Levant gets to interview a sweaty victorious Justin Trudeau for (now defunct) Sun News, directly after the boxing match was the happiest moment in Levant's life.